In honor of Earth Day 2018, Drum & Lace & Ian Hultquist have created a new Ambient Soundscape featuring the voice of Lek Chailert & the Elephants of Love & Bananas. We are selling the track on Bandcamp for $1.00. All proceeds from the purchase of this track will be donated to the Save Elephant Foundation. Listen to the track below & please consider showing your support by purchasing the track! 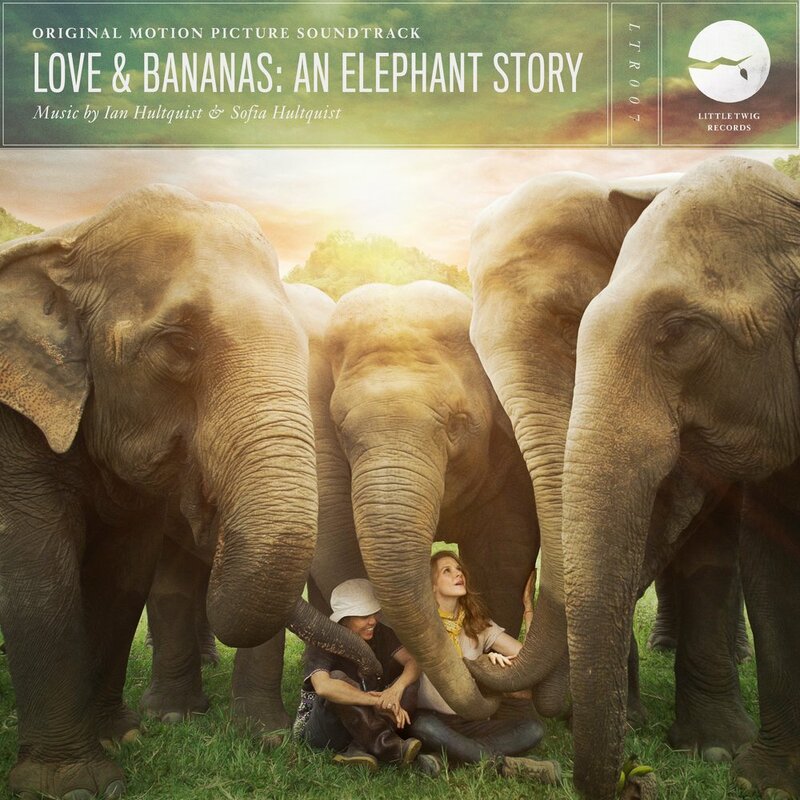 We are so happy to be releasing the soundtrack to Love & Bananas: An Elephant Story on 4/27! In order to continue the film's mission of raising awareness and contributing to the conservation of Asian Elephants we will be donating all proceeds from the sale of this album to the Save Elephant Foundation. Please visit Love & Bananas for more info on how you too can help! We are thrilled to be releasing Ian Hultquist's hypnotic score for the new documentary Bronx Gothic. Dir. by Andrew Rossi, Starring Okwui Okpokwasili, this film is a masterful character study on the artistic expression. Fans of Brian Eno, Philip Glass & Steve Reich will definitely not want to miss this one. Pre-order on 7/7/17, available everywhere digital music is sold on 7/14/17! Click the photo below to check out the trailer for the film! We are so pleased to announce that two of our releases from last year have been nominated for Jerry Goldsmith Awards in the "Best Documentary" category! Congratulations to Ian Hultquist & Sofia Hultquist for their work on The First Monday in May & Silicon Cowboys!! (January 5th, 2017 – Los Angeles, CA) – Little Twig Records will release the CLINICAL - Original Motion Picture Soundtrack digitally on January 13th. The album features the movie’s original score by Ian Hultquist (ANIMALS, FIRST MONDAY IN MAY, THE DIABOLICAL). "The score for CLINCAL is definitely up there as one of the hardest projects I've worked on. Seeing that this was my second time working with Alistair Legrand (Dir. ), we know going in that we really wanted to create something bigger and bolder than we had before. CLINICAL is a densely layered film, and we felt the score needed to reflect that as much as possible,” states Hultquist. CLINICAL is about a psychiatrist who tries to put her life back together after a violent attack by seeking to repair the life of a new patient, but he has his own terrifying history. “The music is a melting pot of distorted voices, processed guitars, and of course one of the biggest stand-outs being live Strings & Choir. We recorded with the Budapest Scoring Orchestra in Hungary, and they were absolutely fantastic! Having these live musicians really helped elevate this score to another level. It was amazing working with them, as well as my usual gang of collaborators Sofia Hultquist (Solo Voice), Ray Suen (Solo Violin) & Erik Arvinder (Orchestrator). I was also very lucky to have the score mixed by the incredible Satoshi Noguchi. There is much to be found within these tracks, I would recommend that this soundtrack should be played LOUD," says Ian Hultquist. Ian Hultquist is a California-born, Chicago-raised composer and musician living in Los Angeles. Hultquist studied film scoring at Berklee College of Music, where he married his love of electronic and rock music with his love of film, and began to develop his unique composing style. It was in Boston that he also became a founding member of the band Passion Pit. He began with scoring numerous commercials and short films, which led to work on both his first feature length documentary, IVORY TOWER (Sundance 2014 Selection), and the award winning drama ANIMALS (SXSW 2014 Selection). Ian’s film work also includes THE DIABOLICAL (SXSW 2015 selection), THOUGHT CRIMES (Tribeca Film Festival 2015 selection), BURNING BODHI (Austin Film Festival 2015 Selection), and the MY BLIND BROTHER (SXSW 2016 Selection). Ian and his wife Sofia co-scored THE FIRST MONDAY IN MAY, a documentary on the NY Met Gala, that premiered at the Tribeca Film Festival in April. The First Monday in May & Silicon Cowboys make Oscar's Shortlist! We are extremely proud that two of our release this year have made it on to the eligible shortlist of Best Original Score for the Oscars! Congratulations to Ian Hultquist & Sofia Hultquist for their work on The First Monday in May & Silicon Cowboys. Available on: iTunes, Amazon and all other digital music platforms. Available on iTunes, Amazon & all other digital music platforms. "Big and boisterous and full of reckless abandon, you’ll be hard pressed to find more fun in a pop song this year. Let alone a film score." "In just over two minutes ‘You Swam Off’ achieves folk-pop perfection."